Sunday Studio Visit – an Etsy Weekend! Today’s Sunday Studio visit is focusing on my Etsy shop. I have a great array of handcrafted gifts in my shop which make great alternative Easter gifts! You can also place a custom order for both tableware or jewellery pieces. Speaking of custom orders, tomorrow I will be posting a yarn bowl which was custom ordered for the colours the customer preferred. I think it turned out great. The yarn bowl is a gift for the customer’s mums birthday, and I think she will like it! Readers may remember from previous posts some plates I made impressed with pumpkin leaves from my garden … well these are now live on ETSY. I have listed a dinnerware set which is available as a single setting, or other custom quantities, four place settings for example. Coming soon will be plate size sets – four side plates, for example. Pumpkin leaves are only available in my garden from November to April (approximately), so at other times of the year the plates will be available with other seasonal leaf imprints. And on Friday I sent this pumpkin leaf plate off to a new home in Melbourne – a mere 100km from where I live! And speaking of pumpkin leaves and garden produce I have been busy again this week preserving gods from the garden!! Today it was fermented cucumbers, bottled tomatoes and apple paste, which I can’t wait to taste with blue cheese!! Sunday Studio Visit – or rather Sunday Kitchen Visit! The firing schedule is really busy at the moment in the studio due to my ceramic classes and also my own art work …. so I am firing the kiln today, mostly with student works, plus a few of my own artworks. But my attention today has been in the kitchen – it is that time of year again! An abundance of produce has meant preserving – so today’s efforts involved squash relish and fermented cucumbers. I wont be able to sample the cucumbers for a week as they need to ferment – but i’m sure they will be yummo! The other cool thing about having a vegetable garden are the pumpkin and zucchini leaves which leave a great impression on clay. These plates have a pumpkin leaf impressed into the surface which has been highlighted with black copper oxide and finished with a clear glaze. I am pretty happy with them, even though one cracked! I will be making more, and will have to do so in the next month before the plants die off as Winter approaches. So until next week – have fun! But hopefully I post before then! Sunday Studio Visit – outside the studio! Happy Sunday!! Since making, firing and installing my exhibition in ContainArt last week I have not been in the studio much. 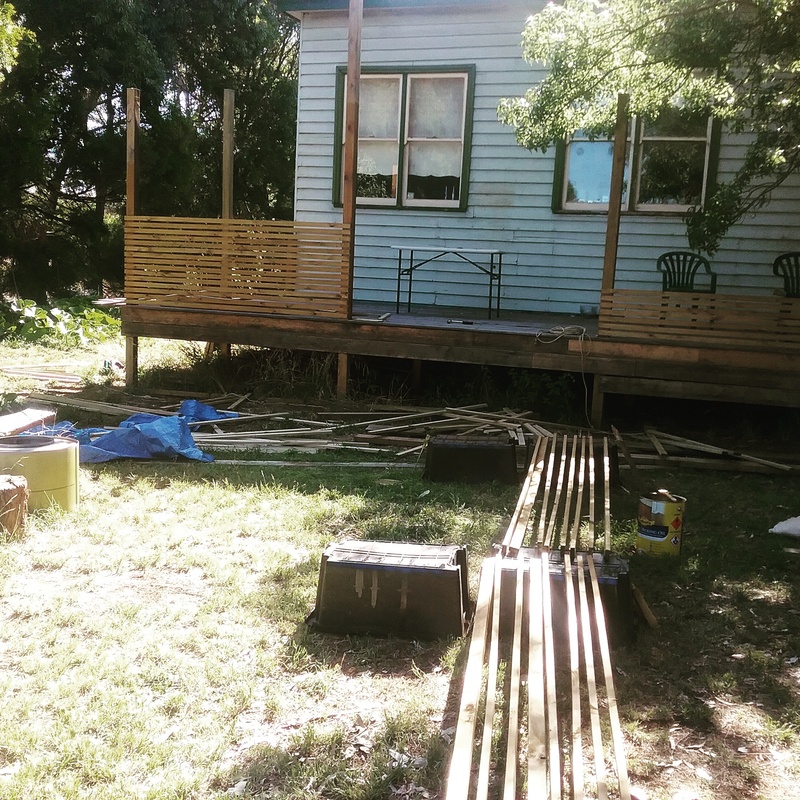 We finally have some consistent nice weather here in Ballarat, after a miserable Winter, so the plan is to finally finish the deck – a year later!! The delay has been a combination of aforementioned weather and also some ongoing health problems I have been having over the Winter and into Spring…. I am finally starting to come good, but have the occasional relapse for a couple of days. So annoying! Anyway, I have spent the weekend oiling slats for the deck railing and hubby has been putting them up (under supervision – lol). So, it looks like we will have our deck finished this summer – yay!! 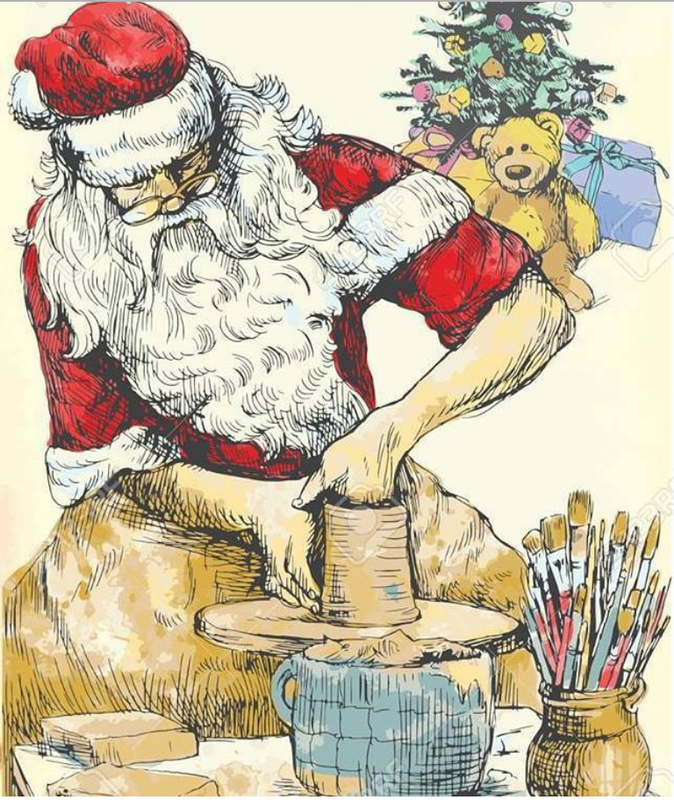 Merry Christmas everyone and thanks for visiting my blog throughout the year even though I have been scattered in my posts and in visiting others due to ill health. My New Years Resolution is good health and, therefore by default, more regular posting and visiting!! I said in my last post I was going to start posting more frequently after ill health – but getting so far behind in my teaching and firing schedule and other business stuff – plus a bit of a health relapse – meant it just hasn’t happened. So I am going to call it quits for 2016 and make my New Years Resolution to have GOOD HEALTH!! I have never experienced six months of ill health before and it has done my head in!! So here’s to 2017. I will leave you with a couple of pics of works in my ETSY store though because I am having a boxing day sale – perfect: no need to visit the chaos of the malls, just buy online!! At the checkout use ‘boxingday2016’ and receive 20% off your entire purchase – what better way to end the year?